As noted in the last post, I’ve had some interesting problems with Sie vs. Du. I’ve also had some personal victories with moving from Sie to Du with certain individuals. It may be dorky to admit this, but every time I’ve successfully moved into Du territory no matter how little or major my efforts were, the following inner reaction occurs: my heart skips a beat, I feel giddy with happiness and my inner self yells out a warrior cry in victory. What can I say…I’m a dramatic person. I also do a mental fist pump if that helps you visualize the reaction a bit better. Before I confess the details of this important journey, I’d like to mention that there’s a show the acrobatic students put on at the end of every year. The pictures in this post are from the rehearsal that they put on for friends, family and the school staff and faculty last week. Seeing one’s students outside of the classroom is always a surprise but seeing their passion and hard work on display for the public was absolutely magical. The student above, M, has been performing for years at various venues and with different performance groups all over Europe. He may be one of the laziest students out of all my classes but his talents overshadow his lack of interests in studying. He did such a fantastic job throughout his performance last week that he temporarily made me forget my former frustrations and tsk-tsk-ing at his terrible English performance. Gaining territory with parents: When I visited H in his hometown of Freilassing, his mother greeted me warmly with Grüß dich! [the informal greeting used in Bavaria] and I awkwardly and hesitantly replied with, “Uuumm….Grüß Gott! [the formal greeting used in Bavaria] It’s a pleasure to meet you (formal)!” She awkwardly shook my hand and puzzled over my insistence on being extremely formal, especially since she introduced herself with her first name. A while later, I chatted with her in the kitchen and used the formal you again. She stopped me momentarily and told me that I could just call her by her first name and use the informal you. She also added that she understood that maybe my upbringing or however I learned German may make me feel more comfortable with the formal you, which she’d be ok with it as well. But no need for formalities! Same goes for her husband. I immediately agreed and cheerfully continued the conversation with the informal you. I nearly exploded with happiness that I could immediately be so close to H’s parents. One of my students, E, during her number. Formality vs. Informality “Fails”: I’ve gone to Passau twice to visit my really good friend, Jl, in her hometown of Fürstenzell and I forgot -both times- to ask Jl for clarification in addressing her parents. They both had introduced me with their first names and the same greeting as H’s Mom (see above) the first time around and I replied with the same response as H’s Mom. Although both of Jl’s parents did not insist on going with the informal you, they both looked a bit puzzled when I addressed them so formally. I can’t remember which pronoun they used with me during the first time but I decided to just simply avoid all pronouns altogether during Round 2. They addressed me as Du, which was quite normal for me and I somehow magically avoided any type of pronoun with them. That is…until the last day. It was a bit awkward to say good-bye because of my lack of pronoun use up until that point. But then I decided “oh the heck with it!” and addressed them both formally; thanking them for their hospitality and for agreeing to host me while I visited Jl. It turned a bit awkward after I had used Sie, but I just assumed it was because saying good-bye to people is just usually awkward. But…I gained a victory anyway (although it’s because J’s parents are so darn nice) in the form of another invitation to visit and stay with them. They both wished me the best of luck with my future, especially in my studies, and said they hoped that I would stay in touch with Jl. I said that was not a problem and inwardly gushed at their farewell. I’m used to my Vietnamese elders wishing me well in my studies and so I felt a deep and grateful connection when Jl’s parents wished that as well. I still don’t know if I should address them by Sie or Du and was too afraid to ask for fear of coming off as rude. I’m nevertheless grateful that I have a family to return to whenever I come back to Germany, and one who sincerely hopes that I succeed and am healthy and well. One of my students, P, during his number with hula hoops. Fail #2: When I visited my good friend, Jd, in her hometown outside of Hannover, I already knew that I could address her parents per Du because I had asked her (before even meeting her parents) how I should address her parents. As we greeted her Mom at the entrance to their house, her Mom extended her hand with an informal greeting and told me her first name. However, the default mode took over and I addressed her by Sie. She gave me a puzzled look but cheerfully continued talking to me. I can’t remember if she called me per Du or Sie, but I suddenly felt an awkwardness between us because of me calling her Sie. Her Dad introduced himself in the same manner and also gave me a puzzled look when I said Sie. Later on, I noticed that he went from Du to Sie because I had called him Sie so often. Oops…I thought mentally. But her parents were too polite in correcting me and figured I wanted to be formal. How did I come to this conclusion? Because Jd’s boyfriend visited her parents for the first time during that weekend too and had talked to her Mom on the phone on our way back to the house (we went to Jd’s apartment 2 hours away and also picked up her boyfriend from his place nearby). He answered Jd’s phone when her Mom called because Jd was driving. Immediately, he asked Jd’s Mom if he could just simply address her as Du even though they haven’t met yet, and I could hear her Mom cheerfully and immediately agree on the other end. Awkwardness = the boyfriend calling Jd’s parents by Du and me, the good friend of 6 years, addressing them as Sie. The solution to both these fails will not elude me. First off: I shall ask Jl about the awkwardness of my farewell with her parents. Was it because it was a farewell? Or was it because I insisted on Sie? Secondly: my sister and I will visit Jd again and will most likely stay at her parents’ house. I’ll simply ask her parents if I could just call them by Du, since I noticed Jd’s boyfriend doing the same and they will, naturally, say yes. This also means I need to ask Jd what her parents’ first names are again. 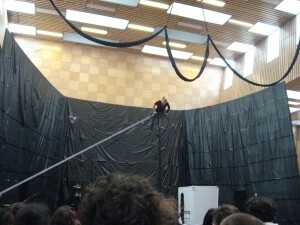 The rehearsal stage and a student performing. I didn’t have her in class but she did a fantastic job. 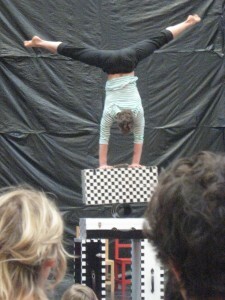 This entry was posted in Jill Nguyen '10, Fulbright to Germany and tagged Du, Formalities, Sie. Bookmark the permalink.